to Fah (Y12) and Mew (Y11) for achieving the top two highest scores in Thailand for their singing exam in November 2017. The students attend the award ceremony on Sunday 4th March, hosted by Trinity Music Thailand, at the Bangkok Art and Culture Centre. 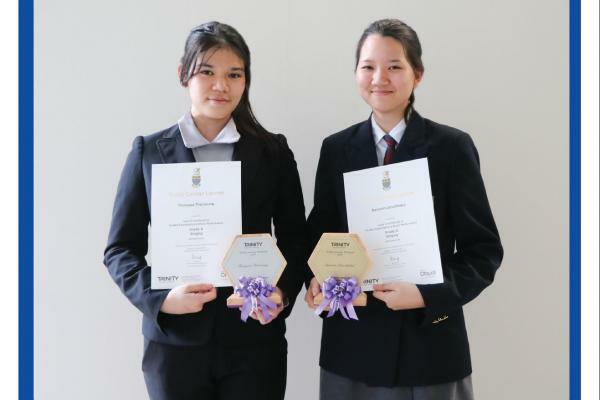 Congratulations to Fah (Y12) and Mew (Y11) for achieving the top two highest scores in Thailand for their singing exam in November 2017. The students attend the award ceremony on Sunday 4th March, hosted by Trinity Music Thailand, at the Bangkok Art and Culture Centre.